Cathrine comes from the west coast of Jutland, from small town called Ringkøbing. In January 2013, what seemed to be a “normal” internship became an amazing academic journey that allowed her to develop her thesis in collaboration with the Danish Cancer Society and improve her social research skills . In this post she will take you through her journey by sharing her experience. I am a Bachelor’s student from January 2013 with specialisation in Public Health Nutrition & Food Policy. 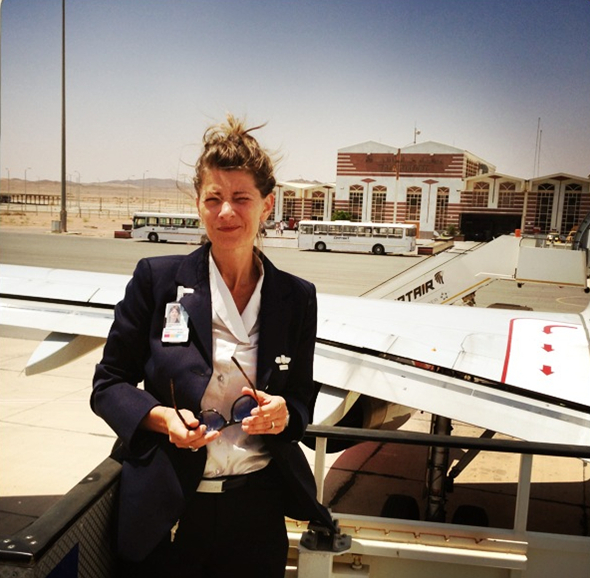 I am currently looking into possible candidate programs and at the same time applying for jobs while working part time in my old line of work: as an airhostess at SAS. I am 41 years old, I am married and together with my husband we have four(!) sons. My Bachelor’s thesis “Transfer of Menu Board Labelling experience. From the United Kingdom to a Danish setting” was developed in co-operation with the Danish Cancer Society’s Department of Prevention & Documentation. 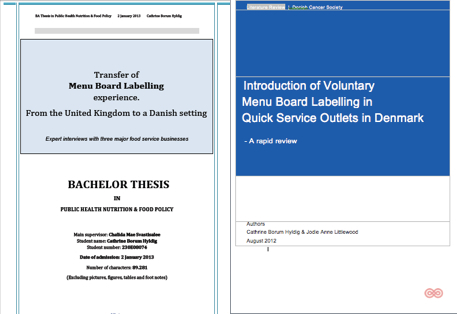 My findings at this moment are being used by them, the Consumer Council, The Danish Heart Association and the Danish Diabetes Association together with major Danish fast-food outlets, to develop a set of guidelines to implement Menu Board Labelling in Denmark. A fellow student and I did a literature review of relevant grey and scientific literature on implementing and effects of MBL (primarily literature from USA) and based upon the review and the report and guidelines already developed for implementing MBL in the United Kingdoms, we wrote the guidelines and recommendations for MBL implementation here in Denmark. But coming to an agreement between industry and the involved Danish NGO´s has taken longer than expected. Therefore MBL with not be implemented before summer 2014. Initially I and a fellow student was doing our 6th semester (and I also my 7th. semester) internship at the Danish Cancer Society, where our tasks was to do a literature review (which we had only briefly had experience with once before at the 5-days-exam) of grey and scientific literature on the international experience with Menu Board Labelling (MBL) and the effect on the consumers, followed by a written report which with recommendations on how to implement MBL in Denmark and assure the Danes understanding and correct use of this calorie/kilo Joule information. What started as an internship randomly picked turned out to be a huge academic journey for me. We were assigned our own office and our results and findings were closely followed by the Ministry of Food, Agriculture and Fisheries of Denmark (Fødevareministeriet) and the Danish fast-food industry involved in the project. From knowing little (nothing!) about MBL we both turned out as “experts” on the field. This led me to the decision to stay at the Cancer Society for another internship. This way I could use my knowledge and expertise and to turn my Bachelor’s Thesis into a project, where I could partake in the next step of implementing MBL in Denmark as well as further increase my academic skills; in project management, social research and in academic writing. Not skills usually linked with a profession’s bachelor, but most definitely something this specific education enables the students to master due to the combination of modules and relevant internships. I was so fortunate to experience my work being used immediately, which was made the process extremely rewarding. After submitting my thesis and before the final exam, Metropol (Aileen Robertson and Alexandr Parlesak) offered a session in how to turn our Bachelor’s Thesis into a new abstract and poster with intends to admit them to a variation of nutrition conferences worldwide. I submitted my poster and abstract to the Danish Society of Nutrition Research (Selskabet for Enæringsforskning) and the International Society of Behavioral Nutrition and Physical Activity (ISBNPA) and I was accepted to both. 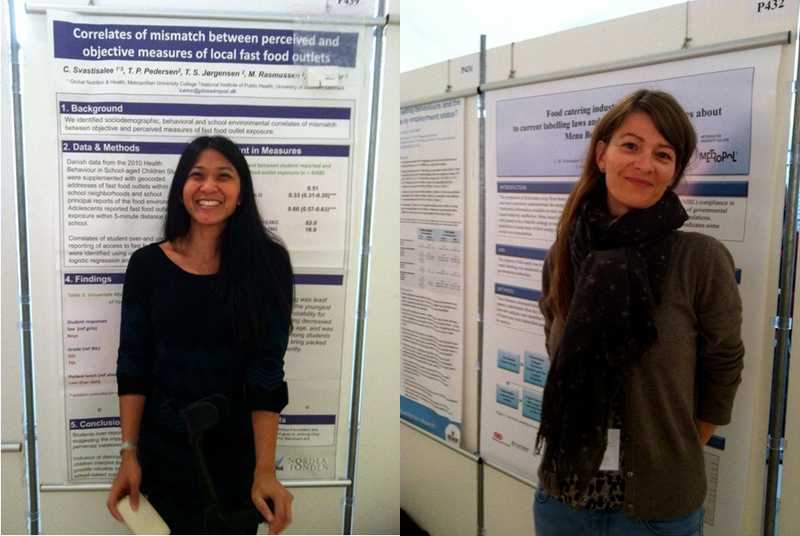 At SfE I was giving a power point presentation on my findings and MBL knowledge and at ISBNPA I was presenting my poster together with the always-great Chalida Svastisalee. I received a small funding from Metropol that covered approximately 1/5 of my expenses and unfortunately the Cancer Society was not able to assist my journey with funding. I personally had from the beginning decided that attending was an investment in the future, but I also know that some have been accepted but have had to decline to attend due to lack of ability to cover all the expenses. B U T, attending these conferences gave me the opportunity to do some very important networking with students and professionals (besides finding the boarding card of a professor at Aalborg University and in return getting an open invitation to attend lecturers, before deciding on a candidate and having a “near-death” experience in a taxi on the way to Ghent Airport with Chalida and two wonderful ladies from the DTU National Food Institute and to talk about my research and education in a inspiring and very professional environment. It is in point of fact a great and helpful piece of information. I am glad that you just shared this helpful information with us.